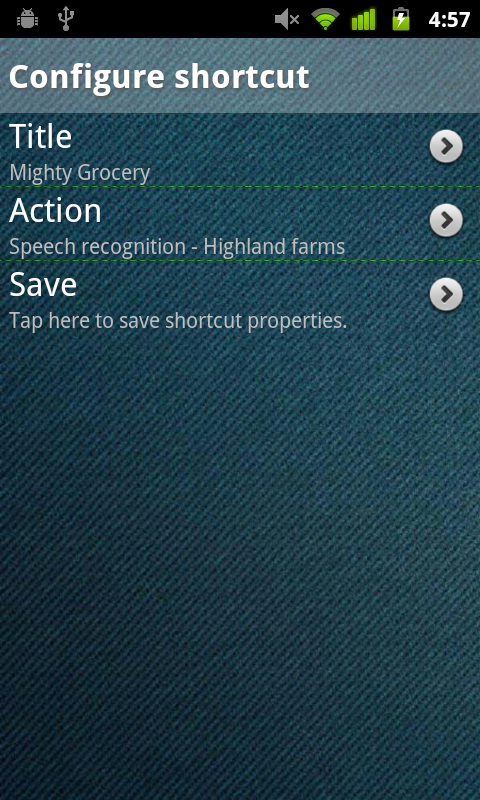 App Widget and Shortcuts enable easy way to access pages of Mighty Grocery app directly from your phone’s Home screen. App Widget is also capable of displaying number of items remaining in all shopping lists. Shortcuts allow one-click access from phone’s Home screen to Current list, Speech recognition, Favorites, etc. Press Home button of your phone. Long-tap free spot on your phone’s Home screen. Tap Title to set your shortcut title. Tap Action to choose action you would like to be performed when user taps this shortcut. Tap Save to confirm changes. App Widget allows quick access to preferable app screen and shows total remaining items. Tap Title to set your widget title. Tap Action to choose action you would like to be performed when user taps Mighty Grocery Widget. Note: App Widget is unavailable if application has moved to SD card. 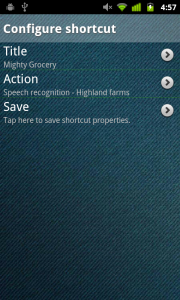 If you want to use Mighty Grocery widget, the app needs to be stored in phone memory. Please see Android SDK documentation for more details. Mary, thank you for your question. Unfortunately, entering recipes from your computer is not supported in Mighty Grocery yet. We plan to make this available going forward. The latest update has the voice recognition button burried further into the app. How fo I move it back to the opening screen? Kari, to move microphone button on top, just open the Sidebar (Side Menu > Show sidebar) and long-tap the mic button. You can move Edit mode button from the top to sidebar by long-tapping it as well. As you might’ve noticed, the microphone button is available in Edit mode. So just tab the lightning button and voice recognition is at your fingertips. I have bought this Application and enjoy using it every day. If you add to this app. Will I still get the new add-on without having to buy it again? Tudie, thanks for your feedback. No, you won’t need to buy the app again if new features added. However some larger features like Meal Planner may go for extra fee, though this is still under consideration. Hi Tiger, thanks for your feedback! We will consider adding Barcode scan option to shortcuts actions going forward. Thanks! Which means 3 out of 5 items still need to be purchased. The widget keeps updating depending on status of items. Please see ColorNote notepad app widget, so that you can see what type of widget I’m talking about. Once you add that feature I’ll buy your app. For now I’ll keep using colornote for my shopping lists. I know colornote does not have many of the features your app has, but it has a very useful widget. Hi Anduz, thanks for your suggestion. We will consider this feature going forward. Wanted to buy the app today.. and still thinking because it lacks a normal widget (as a list on a home screen) like in”out of milk”. In other ways it’s the best. So is there gonna bee this type off widget? Also were can I see the looks of Web interface? Hi Anton, thanks for your feedback and your questions. Kindly note that we may consider adding full-size widget down the road, but it’s not in top priority list. The link to the Basic Web UI is the following: http://my.mightygrocery.com More features are planned for Advanced Web UI. Hello I just downloaded the app, I thought it looked very useful for what I was starting to do and that is couponing. This migty grocery has it all and I’m going to use it to the fullest, except which store has what item at discounted price. Something to think about. This what I’m going to use for when I go shopping do my adds make my list. Then just have my phone, I already have enough in my hands with the coupons and all the stores add’s . Hi Joey, thank you for your feedback. Do you mean you would like to track item coupons per store? This is a part of planned “Compare store prices” feature. And I hope it will be available soon. Please let me know if you have any comments or question. Any way to add “add item to current list” as an action. Better yet…”add item to current list with voice”? As is this, the widget really only saves one click vs. the standard shortcut. Mike, thanks for your question. Kindly note there is a “Speech recognition” option when you add shortcut to your phone’s Home screen. Unfortunately, this option is unavailable for App Widget. As for quickly adding items, if you had a shortcut which navigates you to the current shopping list, it would take you only two clicks to add items to current shopping list: first, to open current shopping list, second, to initiate adding a new item.